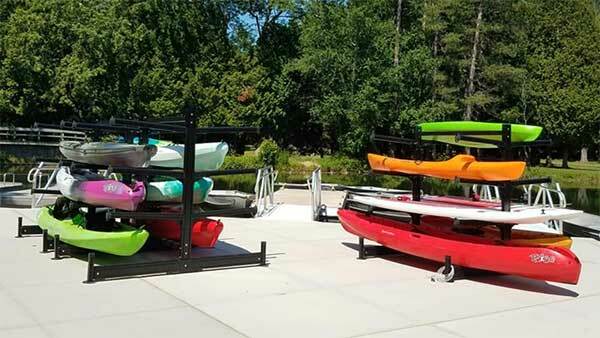 Floating Kayak Docks, ADA Docks and More! We look forward to hearing from you soon! Please contact us through the info below. Monticello Indiana creates recreational opportunities for everyone to enjoy! The city of Monticello, Indiana had a vision to make their river – The Tippecanoe – one of their greatest assets. A comprehensive Parks and Pathways Plan of 2011 charted the course. The rest is history! Recognizing that the quality of life is vital to a successful community; the Parks department set out to provide a variety of recreational opportunities that contribute to the health and wellbeing of the entire community. Making their main park – City Park an accessible site was an integral part. 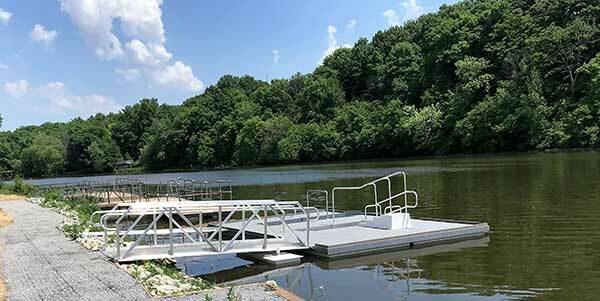 By installing a Kay-aKcess ADA Compliant Floating Dock system, which provides access from a wheelchair height down to dock level, makes loading and launching easy for all paddlers. Now canoeing, kayaking and paddle boarding is being enjoyed by all who want to participate. Congratulations to the City of Monticello for making their vision a reality! 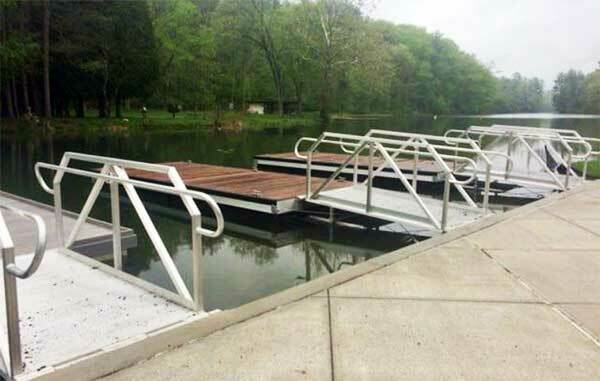 The installation of a Kay-aKcess ADA dock/launch at Chenango Valley State Park was one of the beach area improvements; under the NY Parks 2020 Initiative. The 2020 plan is creating a park system for the 21st century. It promotes healthy, active recreation and provides universal access to people of all abilities. The project included an ADA accessible splash pad and play area, ADA accessible kayak and row boat launch, water slide and sand volleyball court. The improvements enhance the recreation and play for all ages and reduced paved areas and expanded green spaces. Kay-aKcess worked with Saratoga Associates Inc. Architecture and Landscape Architecture who designed the project and Procon Contracting who completed the installation. Access Associates Inc. is very proud to have been a part of this transformation. 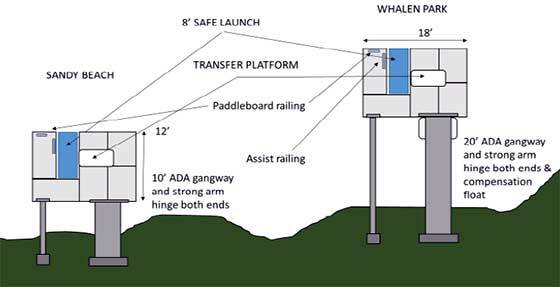 Contact Us for more ADA Kayak Dock information. The town recently added a kayak and canoe dock at Scalloptown Park, looking to offer more access to the EG waterfront and redirecting those smaller craft away from the busy town boat launch. The dock is handicapped accessible, which explains the extra poles and what appears to be steps. 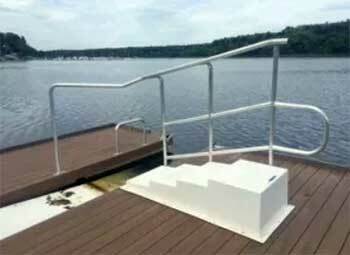 Someone in a wheelchair can use the steps to ease themselves from their chair down to the kayak. "If we're doing it, why wouldn't we make it handicapped accessible?" said Community Resources and Parks Director Cathy Bradley. "It's a great activity for all abilities." The focus on the waterfront was spurred by former Town Councilman Bill Stone, who made creating an emphasis on the town's waterfront part of his 2014 campaign. He served from 2014 to 2016. Councilman Sean Todd (2014 to present) has continued that work. Bradley said she applied for the grant in 2016. The dock was assembled over the winter at the town's highway garage and installed in April. Bradley said the Coastal Management Resources Council (CRMC) – which needed to approve the dock – was very supportive. The dock will cut down on shoreline erosion caused when people put in at undesignated areas. Last year, L.L. Bean ran a kayak operation from Scalloptown Park but Bradley said they will not be returning this year. The town's Cove Commission has heard there is some interest from vendors in operating a rental facility (L.L. Bean ran guided kayak trips, not individual rentals) but the Town Council would need to approve any rental operation on town property. So, for now, it's BYOK (or C). Contact Us for more kayak dock information. The Town of Louisville, N.Y. is installing two handicapped accessible kayak docks at locations on the St. Lawrence River. 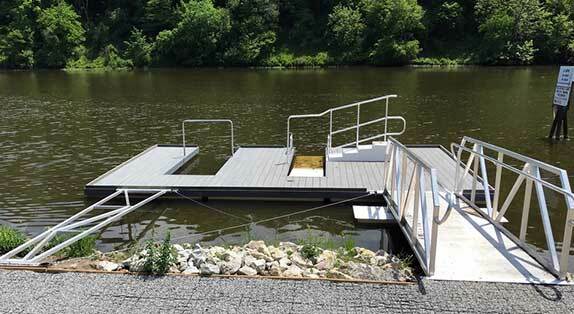 Each of these Kay-aKcess docks is 12' x 18' with a 3' x 8' Safe-Launch, side assist railing and a stand up paddle board (SUP) railing. 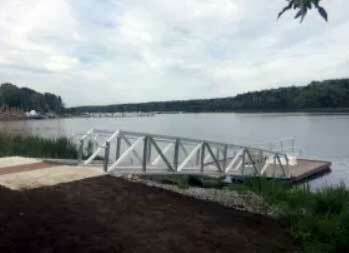 Following up on a local resident's suggestion, a grant was obtained to purchase the docks. The township anticipates the docks project will attract people to their region as well as provide more opportunities for individuals and families to enjoy the water way. 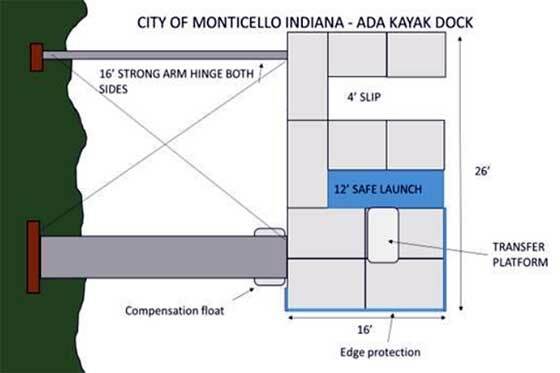 The City of Monticello, Indiana is installing a 16' x 26' Accessible dock with a 3' x 12' safe launch, 4' x 12' open canoe slip with and an overhead, side assist and Stand up Paddle Board railing. 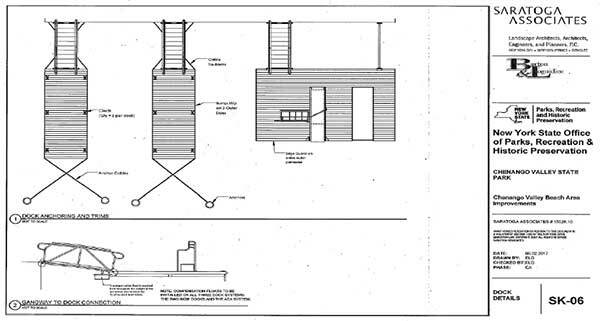 The City of East Greenwich, Rhode Island is installing a 16' x 18' accessible dock with a 3' x 12' safe launch. And the New York State Office of Parks, Recreation and Historic Preservation, is making major improvements to Chenango Valley State Park as part of the Governor Cuomo's 2020 Plan to modernize the NYS Park System. This project is making major improvements to the Beach area. Work has begun and will be completed in the spring. We are excited for spring to get here so we can see all of these projects come to fruition and know that we played a part in helping them enable more and more people safe, easy access to the water. We will share more information on these projects as they get in the water! 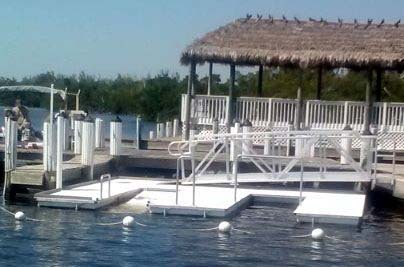 Pineland Marina recently installed a Kay-aKcess kayak dock at its Pine Island location in Bokeelia, FL. At the fore front of the marina industry, they were looking to expand the already extensive amenities they offered to their client base and to grow their market by welcoming the multitude of paddlers- canoeists, kayakers and stand up paddle boarders to their prime location on the Great Calusa Blue way Paddling Trail. Identified as one of the nations' top paddling trails, it meanders 190 miles along the back bays and wild life laden shores of Lee County on Florida's gulf coast. It has become a popular area for catch and release fishing from kayaks, canoes and SUP's. The trail is one of few in America that has a GPS-enabled smart-phone application. Being cognitive of their market and the changing demographics, they seized an opportunity and installed a kayak/canoe dock, taking an underutilized boat slip and creating a destination point for people of all ages and ability levels to easily and safely access the water. The dock sits 7" above the water and is accessed by a gangway. 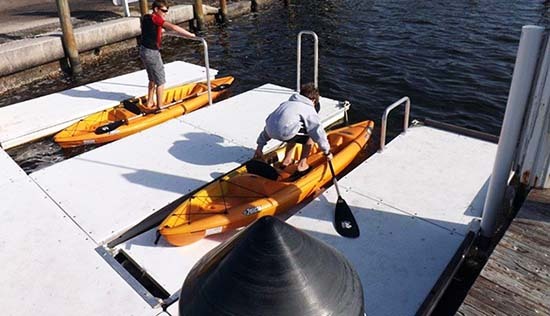 It sports a 12'x 4' slip, with an overhead assist bar that can be used for both canoes and kayaks and a 12'x 3' safe launch, with a side assist bar for kayaks that eliminates the fear of falling, providing additional stability and security. The dock also features a Stand up Paddle railing that adds stability getting on and off paddle boards. 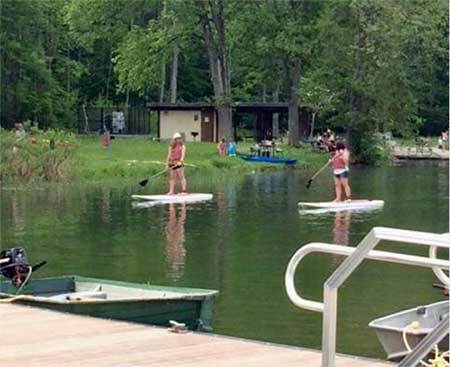 Multiple paddlers' can use the dock at the same time. Pineland Marina welcomes all to get in the water for fun, relaxation and adventure! 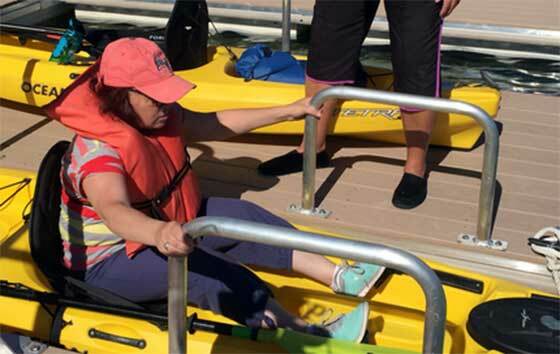 By Mariana Domingues FAYATTEVILLE, N.Y. (NCC News) – Green Lakes State Park is the first in New York state to receive an accessible kayak launch. These docks are part of Governor Cuomo's NY Parks 2020 plan to improve state parks. The launch, installed three weeks ago, gives people more stability when getting in and out of a kayak. Wheelchair users, for instance, are able to lower themselves into a kayak using stairs or an overhead railing. Hand bars also allow people to push themselves out on the water. Susie Turner is a wheelchair user and regularly visits the park. She says she is now enjoying an activity she hasn't been able to do for a long time. "This is the first time in sixteen years that I've been able to kayak," Turner said. "So this… It's bringing my life back to me." Katie Mulverhill and other kayak instructors say using the launch is a safer and more efficient way to get on and off a kayak than from the edge of the walkway. "And it cuts our time down probably by two-thirds getting everybody in the water so we can really maximize the time out on the water, learning about some safe boating and having a good time," Mulverhill said. Mulverhill believes this is increasing people's access to the water. "And that's what I hope to see in the future — is just more people being able to see more of the park," Mulverhill said. Laura Tully is the park's manager and believes this facility will benefit everyone. "You know a lot of people will look at an accessible kayak launch and think that this was put in for people with disabilities or different levels of abilities, but it's for everybody," Tully said. "So we've got this beautiful kayak launch and we want everybody of every ability to come out and try it." Kay-aKcess is pleased to announce their listing in the National Center on Accessibility Product Directory. The National Center on Accessibility promotes access and inclusion for people with disabilities in parks, recreation and tourism. In conjunction with the National Park Service, U.S. Access Board and many other institutions the NCA is a proven and worthwhile venue for ADA compliance in all areas of public use. See the Kay-aKcess listing on the National Center on Accessibility Product Directory. Find us on Pinterest or become our Facebook friend. Copyright 2018. Kay-aKcess Inc. All Rights Reserved.